When is the last time you relaxed and soaked yourself in a hot steamy bath? More than ever, with today's busy lifestyle, your body deserves a nice stress relieving moment in your hot tub. Unfortunately, a tank water heater can only supply enough hot water to fill a bath tub and may have just enough hot water left over for a shower. 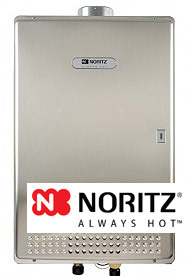 With a Noritz tankless water heater you will get an endless supply of hot water. Tankless water heaters heat water on demand, and that means you never have to worry about running out of hot water. Imagine the luxury of always having enough hot water for everyone to enjoy and relax - hot tubs, showers and still have an endless supply for the rest of your household needs. If you were to approach any professional who is familiar with tankless gas water heaters, and ask them what the main components of a tankless water heater were, they will tell you it's the heat exchanger and the burner. This is basically the heart of tankless water heaters. The durability, efficiency, and performance essentially depend on the technology and quality levels of these two components. HIGHER VOLUME - HOT water for any sized home! Endless supply with more volume - not only can a tankless water heater provide an endless supply of hot water, it can also delivery more of it for all your hot water demands. Only Noritz offers a multi-system set-up that can link up to 24 units, which translates to 317 gallons per minute - enough for over 126 showers at once! With this much volume, Noritz tankless water heaters can meet any hot water demand of today's homes. Over 93% efficient, delivering more than 11 GPM! Noritz is proud to introduce our most efficient tankless heaters, the next generation in tankless technology - condensing heaters. This innovation utilizes a dual heat exchanger, a fusion of stainless steel and copper heat exchangers. The 100% stainless steel component captures the residual heat from the exhaust temperature to preheat the incoming water before it runs through the main copper heat exchanger. This results in dramatic reduction of carbon dioxide and increases the heater's efficiency level to over 93%. The Noritz N-0841MC series - compare the specifications to our competition. When it comes to quality, Noritz takes no short cuts in producing the highest quality tankless water heaters. Unlike other manufacturers, we do not outsource the main components of our heaters. We manufacture nearly 100% of the parts that go into our heaters. We even make the heat exchanger's copper tubing from raw copper. This allows Noritz to have the highest quality control of all the heater's parts and components. The high level of quality is an attribute of TPS Just-In-Time (JIT) Production system. Noritz is the only tankless manufacturer to implement the JIT Production system. This system was invented by Toyota and only one company per industry is granted permission to use this super-efficient, quality control production system in Japan. How efficient is this manufacturing system? We can build and ship out heaters in the afternoon from orders that were processed in the morning. If you have any questions about tankless hot water systems for your home, please do not hesitate to call us at (775) 356-6868. Thank you for your interest in Tankless Water Systems from Reno Heating & Air Conditioning!